Shockwave Player was released first time in 1995 by Macromedia Corp. and later on was acquired by Adobe. Adobe Shockwave Player (formerly Macromedia Shockwave) is often needed by third-party applications, especially on web interactions through browsers such as Firefox and Google Chrome. This app is different than Flash Player, but is similar in what is doing: it allows to display and use multimedia content on web pages (games, videos). It is a browser add-on, now supporting 3D rendering. After installation, you will not see it on your desktop, but the web-based apps will use it and you will be able to use that kind of content. As well as Flash Player and Adobe Air, is recommended to keep this plugin updated, to improve the performance and to reduce the security risks. Adobe Shockwave Player is available as free download for Windows 32-bit and 64-bit. 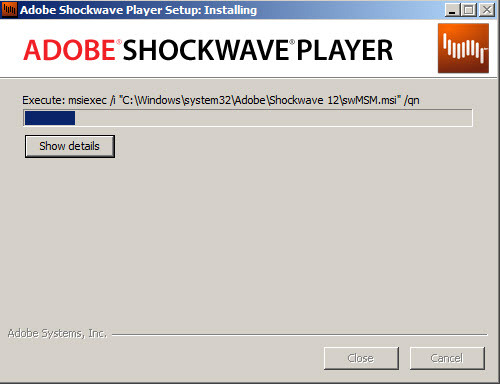 Adobe Shockwave Player is 100% clean and safe to install. You can see the test results here.